High refresh rate monitors have become commonplace now, thanks to the increase in performance that gamers can experience when playing at a higher effective frame-rate. Action feels more fluid, judder is reduced and input lag is also decreased dramatically, making it easier than ever to track fast-moving targets, react quickly and ultimately get the game-winning frag. How does BenQ’s entry-level 24-inch 144Hz monitor stand up against the competition? Let’s take a look. The XL2411 has a slightly asymmetric design, with a chunkier bezel on the bottom right corner which houses the downward-facing buttons for the on-screen display. Apart from this, the bezels are of moderate thickness on all four sides, making this monitor less than ideal for multi-monitor setups. The lips around the screen are apparently specially designed to minimise distractions caused by reflections, although we couldn’t notice any specific difference in a blind trial. The monitor is constructed from black matte plastic, with none of the red accents that we normally see on BenQ’s higher-end gaming gear. If you prefer a more modest design, you will appreciate this. The monitor is supported by a highly adjustable stand, mounted on a square base. There’s a small inset area in the base, making it a good home for loose change, your keys, sandwiches and other detritus. The stand allows you to rotate the monitor into portrait mode, swivel it back and forth, and the height can be adjusted by 130mm. VESA (100×100) mounting is also a possibility. The back of the monitor has downwards-facing ports, with DVI-DL, HDMI and VGA on offer. There’s also a power input and a 3.5mm input, which connects to a headphone port on the left side of the monitor. 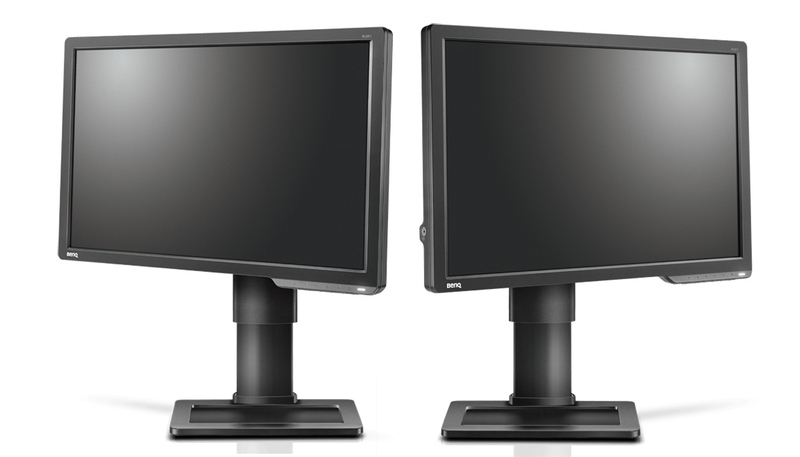 There are no USB ports or OSD controller as we see on more expensive BenQ monitors. All in all, a very standard monitor that doesn’t really push the boat out when it comes to design – you could easily use this monitor in an office environment without turning heads. We tested the XL2411 in Counter-Strike: Global Offensive, Torment: Tides of Numenera and Project CARS. We also wrote this review, edited some photos and carried out other journalistic work over a one week period, using it as our primary monitor. Given its relatively low price point, we were happy with the XL2411’s performance. There was no discernible input lag, and the 144Hz mode made playing fast-paced games like Counter-Strike and Overwatch much easier. The small size of the screen meant we placed the monitor quite close when playing these games, as otherwise distant enemies were too difficult to spot. The black eQualizer setting was used to good effect, and the Low Blue Light mode proved useful outside of games. TN-based panels are never ideal for video or photo work, but the XL2411 wasn’t too bad either. Once calibrated, it boasted relatively high colour accuracy and little colour shift was evident when viewing the monitor from the sides, above or below (although brightness was certainly affected). We didn’t notice any significant display lag during our testing. Motion blur is controlled with a setting called AMA, which stands for Advanced Motion Accelerator. As with most BenQ monitors, we found that the middle AMA setting, ‘high’, produced better results than ‘off’ or ‘premium’. Premium resulted in some visible overshoot in some tests, while off had some noticeable motion blur. 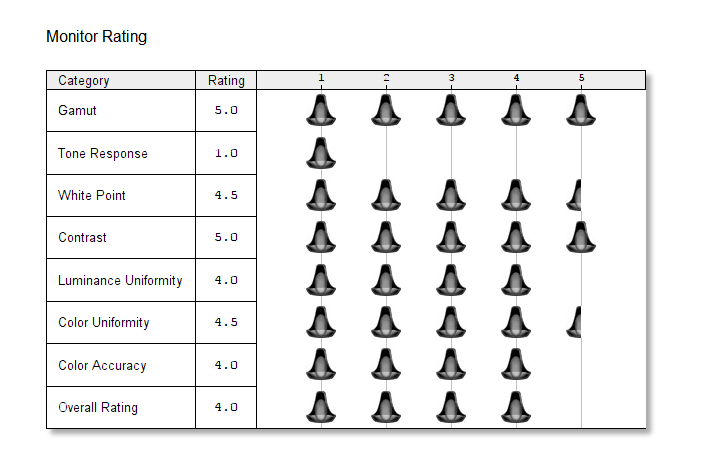 Let’s take a look at our benchmarks now, to get a more quantifiable idea of the monitor’s quality. As usual, our benchmarks are performed using a Spyder4Elite*. We’re calibrating the display to gamma 2.2, white point 6500k and 120 nits of brightness. *We’ll be upgrading to an X-Rite i1Display Pro when our budget allows; this is all we have at the moment so please be understanding. First up are colour gamuts; the monitor hits 98% of sRGB, 72% of NTSC and 76% of AdobeRGB. This is great but not outstanding for a TN-panel monitor, and combined with good colour accuracy means that the monitor can be used for non-critical photography and video work. 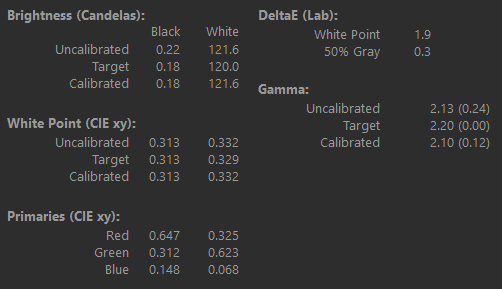 We also have some initial measurements before our advanced testing begins, including a relatively low Delta-E values for white point and 50% gray. We can also see that we missed out 120 nits target by a small margin, with the display being a little too bright. We used the gamma-3 setting, which on this occasion corresponded to a display gamma of 1.9. The gray ramp is relatively even, too. The XL2411 never gets to that elusive completely black measurement, although it gets close, and white point remains pretty close to dead-on at 6400 and 6500K. The contrast ratios read between 620:1 and 760:1, with better contrast being achieved at higher settings. n.b. Our colourimeter consistently under-reads brightness, so this isn’t a poor result by any means. Next up is colour accuracy. We have decent but not great results throughout, with that teal shade proving troublesome once again. 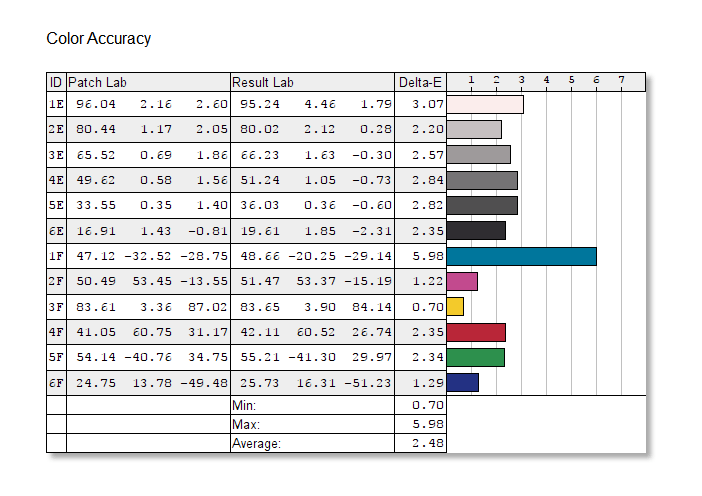 The average of 2.48 is not quite as good as the more high-end XL2540 we tested earlier this month, but it’s still decent for a TN-panel monitor. Colour uniformity is also important, and the XL2411 again delivers a solid result. At anything less than 100% brightness, uniformity is very good with Delta-E values of less than 1.0 on average. Luminance uniformity is a little worse but still decent, with the bottom right quadrant appearing a little dimmer (~12%) than its contemporaries. 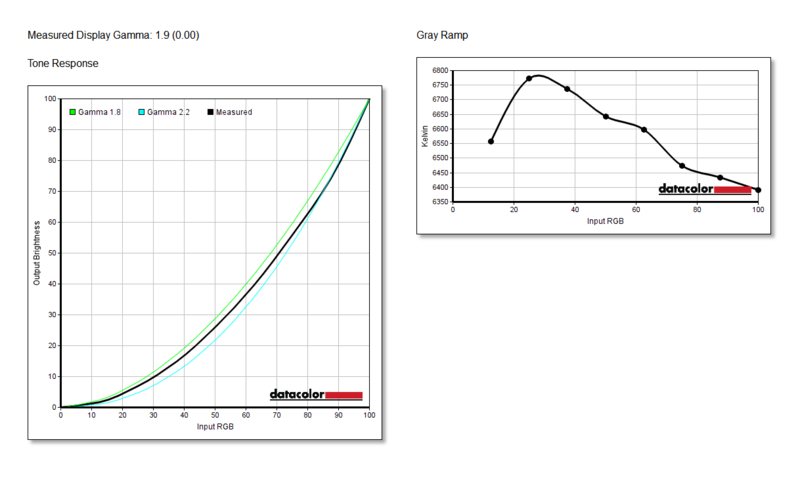 So apart from the weird gamma results, it’s a pretty decent selection across the board with no major flaws. This wouldn’t be a great result for an IPS display aimed at photographers, but for a TN panel aimed at gamers it’s pretty good! The BenQ XL2411 is a solid choice at £240, especially for players of esports titles like Counter-Strike, Dota 2 and League of Legends that will benefit from the high refresh rate. There are relatively few added features here, but that also keeps the price low. All in all, not the most exciting monitor that we’ve ever reviewed, but it doesn’t seem to possess any obvious weaknesses either — not a bad choice overall. Let us know what you think below! Always so helpful! Great review, thanks!